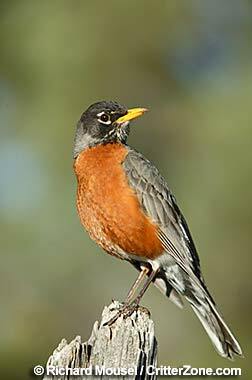 Wisconsin designated the American robin as the official state bird in 1949. Voted on by the school children of Wisconsin in 1926-27, the robin received twice as many votes as those given to any other bird. Wisconsin did adopt another bird symbol in 1971; the mourning dove as the state's official symbol of peace. 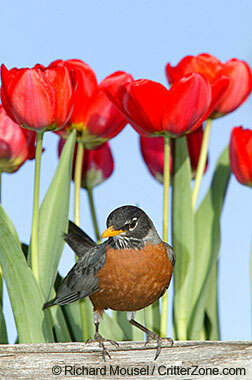 One of America's favorite songbirds, robins are watched for each year as the herald of spring. The American robin has many vocalizations - rich songs composed of long phrases and "whinny" and "tut" calls. The female is muted in color compared to the male. Animal - Wildlife - Nature Stock Photography - Copyrighted image - contact CritterZone for commercial application license or any use.